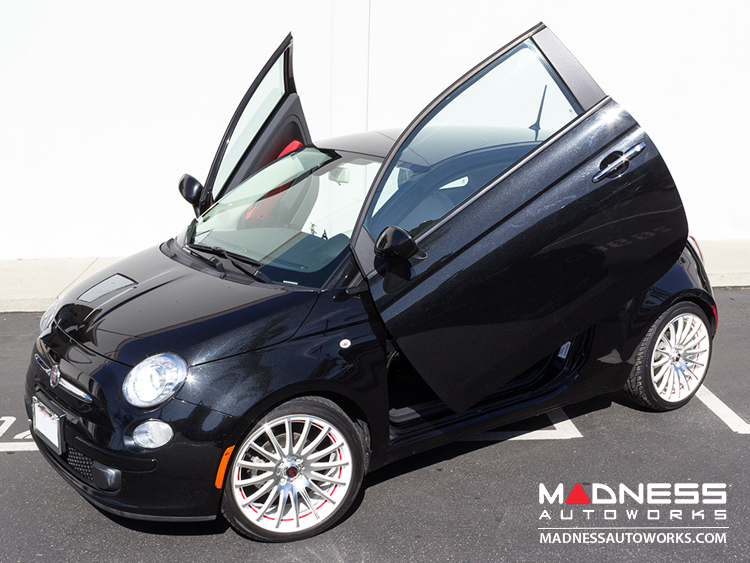 Ready to upgrade the handling of your FIAT 500? Want that even, lowered look? 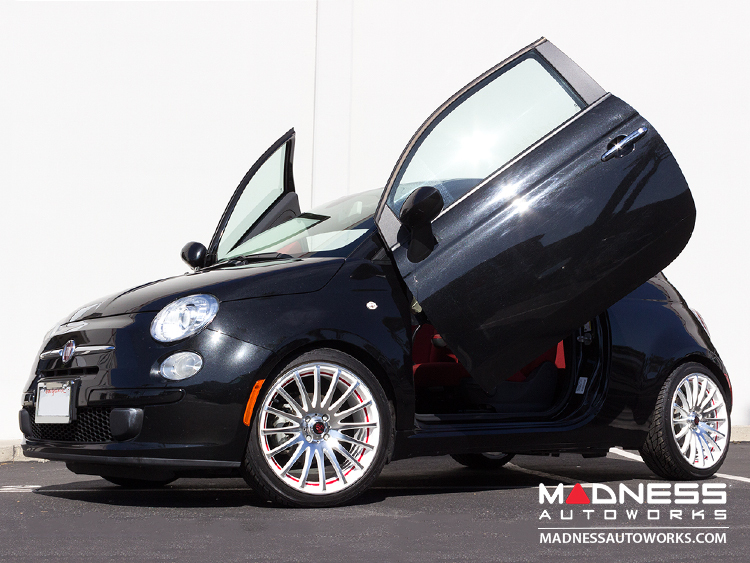 This spring set will fit ALL the North American models of the FIAT 500. 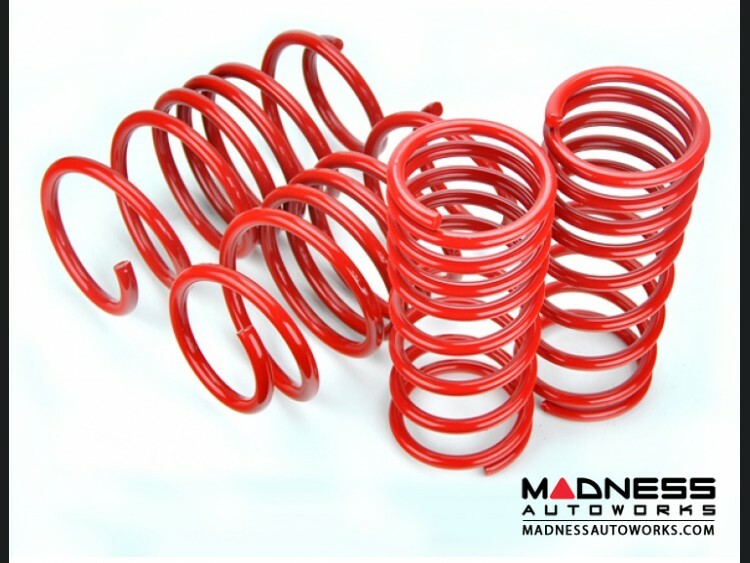 The MADNESS Lowering Springs were developed as a joint effort between us (MADNESS) and our European Partners that produce some of the best performance spring in the world. 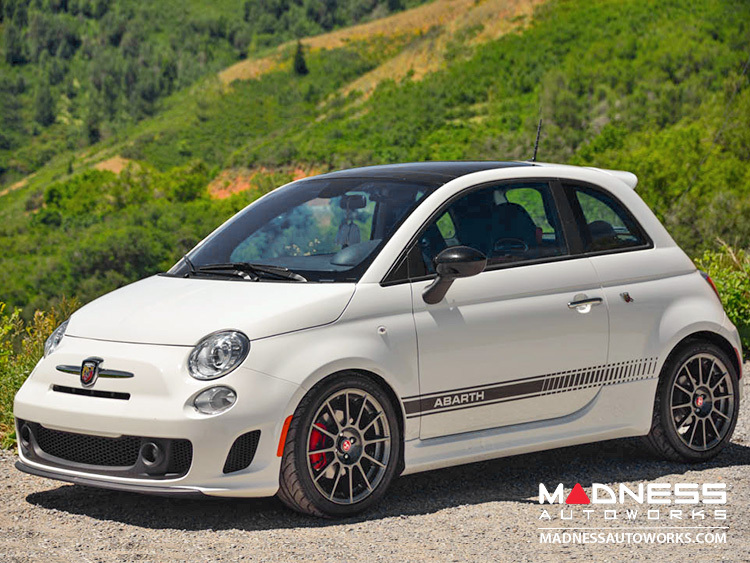 Our goal at MADNESS was to produce a line of performance springs that have been designed specifically for the North American Version of the FIAT 500. Rather then compromise and produce one style of springs to suit everyone we decided to design and manufacturer two different types of springs to specially suit the type of handling and look our fellow 500 owners ask for. 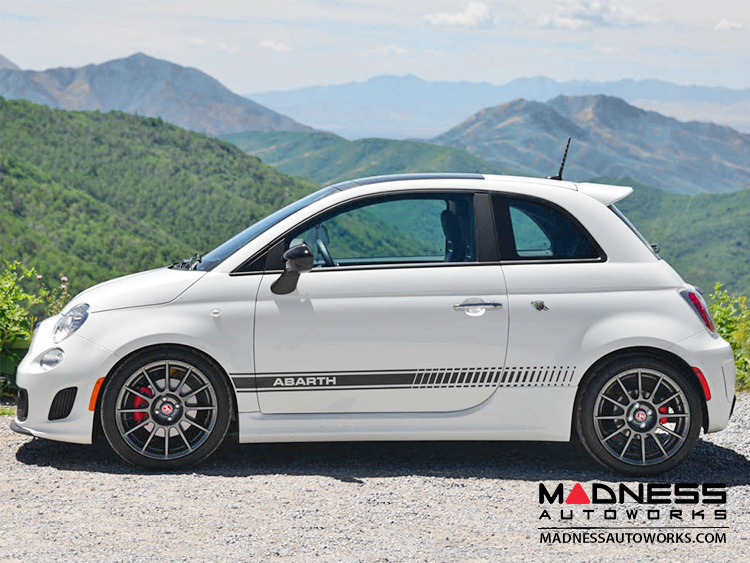 Our MADNESS Edition Performance Springs now come in three versions. Version 1 (Performance) offers the driver an approximate drop of about 1.4". This gives you the best combination or ride and handling. Version 3 (Aggressive II) is designed for someone who is looking for the most aggressive drop. The drop on this set is approximately 2" on the front and a 2.5" in the rear. 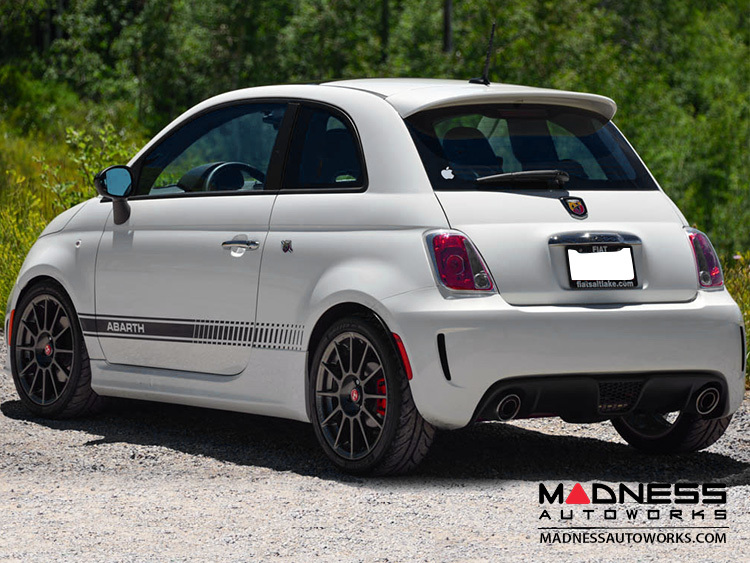 This set is designed to give the car a leveled look. 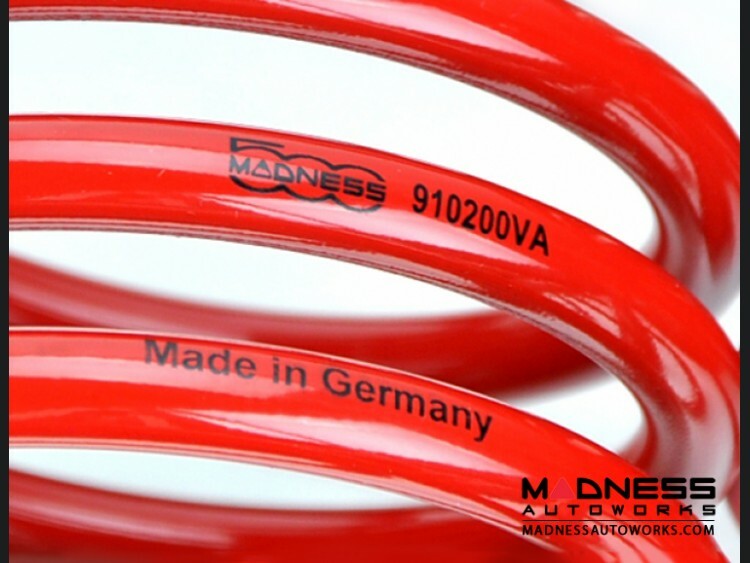 Manufactured to the highest standards in Germany. Don't forget to check out our other suspension upgrade options. 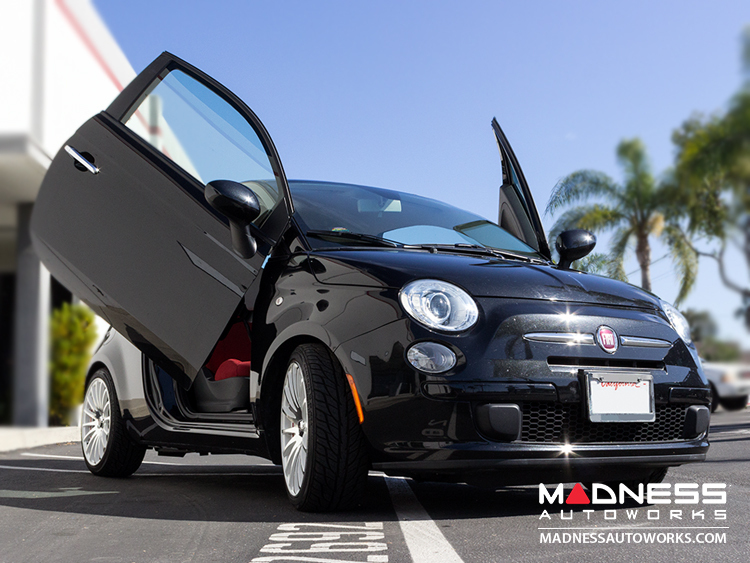 FIAT 500 Custom Wheels by Magneti Marelli - Light Alloy Wheel - Satin Black Finish - 17"
FIAT 500 Custom Wheels by MS Design - Light Alloy Wheels (set of 4) - Machine Face - 17"
FIAT 500 Custom Wheels by Magneti Marelli - Light Alloy Wheel - Satin Black Finish - 16"
FIAT 500 Custom Wheels by Team Dynamics - Equinox - 17x7.5" - Custom Silver Finish - 17"
FIAT 500 Custom Wheels by Magneti Marelli - Light Alloy Wheel - Gloss Red Finish - 17"
FIAT 500 Custom Wheels by Magneti Marelli - Light Alloy Wheels - Gloss Red Finish - 18"
FIAT 500 Custom Wheels by Magneti Marelli - Light Alloy Wheel - Two Tone Black Diamond Finish - 16"